Demitris’s 'pre-comic' life was working as a Financial Advisor, an Ice-Cream Man and also a Civil Servant; during which he now boasts he has signed 'The Official Secrets Act' (though he claims he did not read the small print). Nowadays Demitris keeps nothing a secret! Thought of as one of the best ad-libbers in the business Demitris’s comedic mind questions subjects from politics to Tic Tacs. If that doesn’t do it, he’ll confess his addiction to appearing on TV Shows (he was on the last ever episode of Blind Date and picked his nose on Question Time). His material has sprinklings of surrealism, with historical, topical and educational undertones giving his audiences a heaped tablespoon of funny. 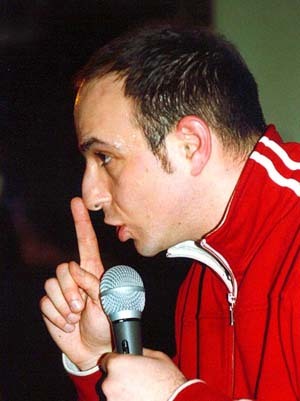 Demitris has been support for the following:Gina Yashare, Alan Carr, Russell Howard, Bob Mills, Dom Jolly, Jo Caulfield, Marcus Brigstock, Jim Tavare, Richard Herring, Norman Lovett, Robin Ince, Mark Watson, Rhod Gilbert, Milton Jones and has appeared on telly with Alan Davis.